From the time we are born we have a relationship with toys. Toys help us hone our senses of sight, hearing, and touch, develop physical coordination, and become keys to express our interests. Toys entertain us, help us relieve stress and boredom, and burn off excess energy. Interestingly, toys function pretty much the same way for our cats. Variety is key: Cats need a variety of toys that relate to different aspects of their personalities, like stalking, chasing, and snuggling. Mouse-sized toys can be hunted and “caught.” Your cat may even “gift” you with her catch. String toys can be dragged around to simulate the chase (and give you and your cat some quality time together.) Just remember to let her “catch the prey,” otherwise the game may be frustrating. Giving her a treat after the catch completes the hunt-catch-eat cycle. Play time: Keep play sessions to about 10 to 20 minutes, so as not to overtire her, and never leave string toys lying around. String can be deadly: Contrary to the cute pictures of kittens with balls of yarn, string can be dangerous. Cats can’t spit things out, only throw them up or pass them. Strings or rubber bands caught in intestines can kill a cat, so always store these things out of reach. 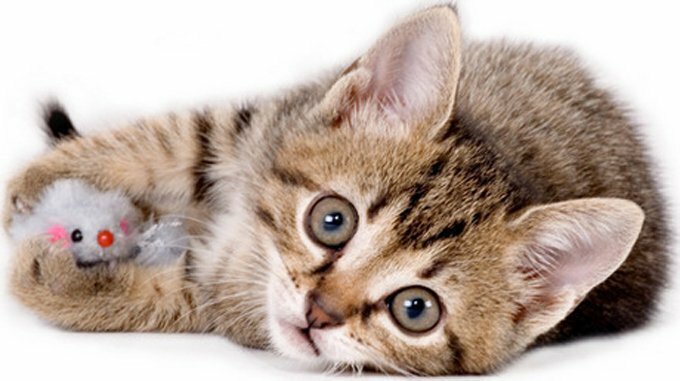 Many toys have strings dangling off of them, that, once ingested, can kill your cat. Please be very careful when picking toys. Laser pointers: Laser pointers are fun, but use caution and never shine the beam directly in your cat’s eyes, or bounce it off a reflective surface. Damage can occur in less than 10 seconds. Use only lasers made for cats that have 5 milliwatts or less strength. Lasers made for business presentations are too strong. As an alternative, shine a lamp off a reflective surface, such as a shiny bracelet, watch, or pinwheel. Make sure the play area is free of anything your cat could fall on and hurt the feline; remember – she’s chasing the red dot and not watching where she’s going. Scratching posts: Cats instinctively need to scratch, and posts also allow stretching and releasing pent up energy. No matter how torn up, abused, and aesthetically unpleasing a scratching post gets, don’t throw it away; if you do, your feline may get upset for discarding the trophy of her hard work. Stuffed toys: Make sure stuffed toys have safe stuffing, and no small parts that could be swallowed. Toys made just for pets, or kids 3 years of age and younger, are generally safe. Catnip: Kittens under 6 months don’t usually respond to catnip, but older cats may love it. Some get aggressive with it, however, so if you have more than one cat, test their reactions separately at first… Otherwise you may end up with a bar brawl. Toy rotation: Switch out toys once in a while (except for the toy she plays with or snuggles with every day – don’t make that one disappear). “Custom” toys: Crumpled paper, cardboard boxes and tubes, and paper bags (handles removed), and other seemingly ordinary household items can entertain your feline for hours. Toxic Toys: If the toy smells of chemicals and you find it offensive to your own nose, don’t give it to your cat. Some cat toys are made of cheap and potentially toxic materials. If the toy is giving you a headache, don’t give it to your cat.